﻿Hydraulic fracturing is a process of injecting fluid into the ground to fracture shale in order to release natural gas. This lecture introduces the basic principles behind hydraulic fracturing (known as "fracking"), illustrates the health and social impacts of fracking, and explores the role of the nurse in caring for and advocating for affected patient populations. 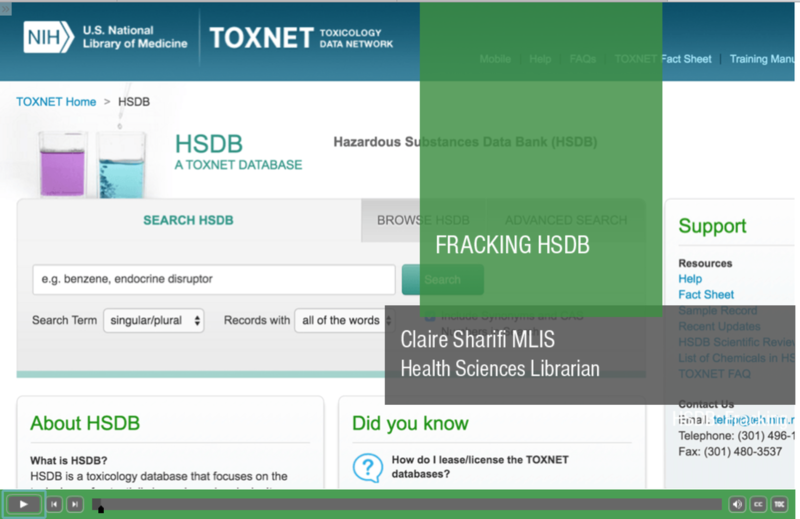 This lecture explains helpful search techniques used for finding information on hydraulic fracturing via the National Library of Medicine's TOXNET database. Nurses can then utilize this information for creating evidence-based recommendations on health monitoring, advocacy efforts, further areas of research, and more. Specific resources discussed include the Hazardous Substances Data Bank (HSDB), Haz-map, and Tox Town. From the United States Geological Survey. USGS is a science organization that provides impartial information on environmental topics, and this page provides an introduction to the science surrounding Hydraulic Fracturing as an energy source. From the Council on Foreign Relations (CFR), an independent, nonpartisan membership organization, think tank, and publisher. CFR publishes Backgrounders, an overview of a complex issues, similar to what one would find in an encyclopedia. The Fracking backgrounder provides information about the global & national implications of fracking. 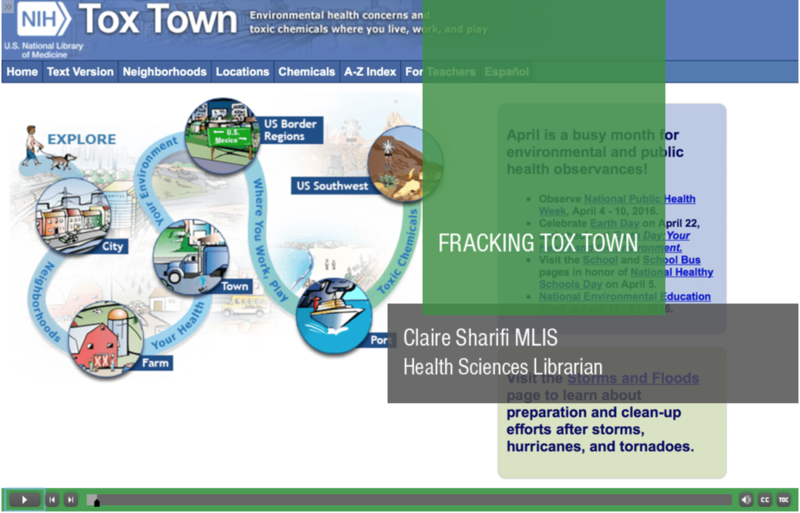 Physicians, Engineers and Scientists for Healthy Energy is a non-governmental organization that tracks the science and policies regarding fracking and other issues related to energy production in the U.S. The FracTracker Alliance is a non-governmental organization that shares maps, data, and analyses to communicate impacts of the global oil and gas industry and informs actions that positively shape our energy future. 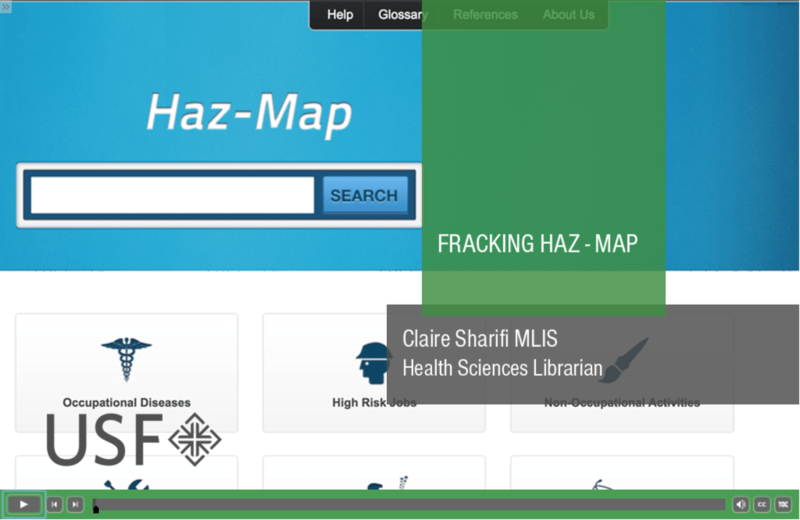 It supports a mapping tool that allows you to find frack sites by state and by country. It also provides excellent photos of a wide array of fracking-related activities. Summary of hydraulic fracturing, with links to USGS studies and energy assessments related to fracking. Provides an interactive and easy-to-follow animation of each of the steps in the horizontal drilling and hydraulic fracturing process, with detailed information about each step and the process as a whole. Maps of shale plays, tight gas plays, and coal-bed methane fields, all of which are accessed through hydraulic fracturing, as well as detailed maps of known oil and gas fields. Detailed assessment and synthesis of existing research on fracking as well as the results of interviews with representatives from government, industry, academia, and community groups highlighting current concerns. Maps of well sites and community regulations, as well as downloadable data for individual drilling sites. Data about well locations, state regulations, and chemical usage related to hydraulic fracturing. The data are self-reported by industry, and may vary in accuracy. Overview of EPA studies and laws related to fracking; provides links to other sources that contain more detailed information about shale gas and the hydraulic fracturing process. Provides a breakdown of state fracking regulations in various formats, including tables and maps. Overview of regulatory approaches that municipalities can consider when faced with fracking. It also offers examples of where each approach has been implemented and the challenges these communities face. A risk matrix that identifies the potential risks (i.e., those that could plausibly occur under normal operating conditions) to be considered when developing a well, examining impacts from widespread drilling activities, or writing regulations. Findings of the GAO in response to congressional requests for information about shale resources, development, and possible risks. Outline of all the potential environmental and health impacts associated with fracking, emphasizing uncertainty and the need for more research. Overview of the gaps in information about hydraulic fracturing’s impacts; offers recommendations for what should be done to correct them. Discusses the potential economic impacts of shale gas development on communities, using Pennsylvania as a model. Considers both the short- and long-term benefits, the costs of extraction, and related activities. ​What did you find? Click "Start a topic" to join the conversation.